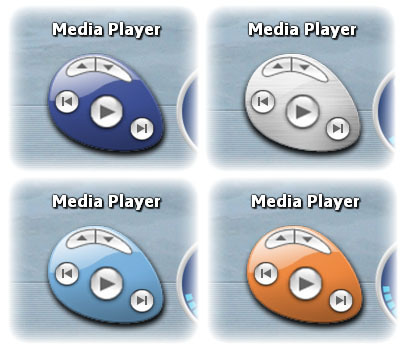 Withthis you can control any media player that responds to a media keyboard - this includes WMP, WinAmp and iTunes. If you ctrl-click on the play button the config will launch the default player for MP3 files. If you ctrl-click on the body it will cycle through three different body styles - plus you can change the color of the body by using the 'Configure...' dialog accessible via the right-click menu: hit the 'Overlay' tab and configure the overlay called 'Body'! To make sure that iTunes can be controlled when it isn't the front-most window you might need to install iTunes MultiPlugin Link . To ensure that you can control WinAmp you might need to go to enable Global Hotkeys in the preferences. To install just unzip into your ObjectDock folder (after you have installed SysStats 2.5). Then add a SysStats instance to your dock, right-click and 'Load...' MediaController.ini. Having problems with this one. I can get the docklet onto the dock, but I cannot see it. I control-click on it, but nothing happens. looks nice, couldn't find the orange 'skin' though. once winap is up and running this config can be used to control the winamp player. To change the color of the skin, open the config dialog, click on the overlays tab, click on 'Body' in the list and hit configure... You can then change the hue and saturation to get whatever color you like. The config runs whatever media play is associated with .mp3 files. You can fix it to a specific app by configuring the 'Shortcut' controller - it currently has %s as the application - change it to winamp.exe (or whatever winamp is called) and it will run winamp. Or you could edit MediaPlayer.vbs to just return 'winamp.exe'. Or you could try and get winamp to register itself as the default player of MP3 files. Either way should work. thanks judge - got the colours, got winamp now, and the bit with the mouse wheel i'd discovered by accident - lovely work - thanks again. or is it dank u weel? The initial running of this docklet caused crash. But everything after that goes well. Can you make it to a skin to Winamp, in the Winamp section? And maybe to Windows Media Player to...thx! nice, .. make it into a desktop icon too ! I am curious whether it is possible to add a seeking bar. Just as rmccabe916 says. I can get the docklet there, but I can't see anything and it doesn't do anything... I'm not quite sure how to install this stuff. I just got into it yesterday... I've got the basic settings for the dock down...but the more advanced things I'm still learning... any help would be nice. Looks great, but it always launches iTunes, even though my default player is WMP11. Argh! I was looking and I didn't see this problem mentioned. Whenever I shutdown windows forcing Objectdock to restart upon logging back in the file (MediaController.ini) goes blank in the dock and is unusable. This isn't only when I shut down but if I log out of windows then log back in it happens too. The only solution I have found is to unload sysstats and then reload sysstats and reload MediaController.ini. If there is any solution to this problem please point me in the right direction. My media player now stopped working for the play and skip track buttons. The volume still works but nothing else does.